My Polo Grounds memories center around Stan the Man Musial. I saw him in only two games but watched him hit four home runs! First, though, I need to backtrack a bit for that first game because that took place in Yankee Stadium on my 12th birthday in 1960 when my father took me to the 2nd 1960 All-Star Game where the NL beat the AL 6-0 on 4 home runs by Eddie Matthews, Willie Mays, Stan Musial and Ken Boyer. was a really old man of 40 and I can still see him in the batter’s box, coiled like a snake, his bat sticking straight up like a flagpole and not moving a hair until the pitch came in and then suddenly CRACK and there goes the white orb! In this at bat, the orb sailed high and deep to right and landed way up in the 2nd deck of Yankee Stadium. Now fast forward 2 years, the date is Sunday, July 8, 1962. I am now 5 days short of 14. Stan is now triple my age at 42! He’s now 2 years older than the old man I saw at Yankee Stadium! Stan the Man as in Old Man River! The place is the Polo Grounds because we now have the brand new expansion team called the New York Metropolitans and there is Casey Stengel bringing out the lineup card to home plate. Now to set the stage for Stan the Man, the day before (Saturday), the Cards and Mets played a double-header at the PG. 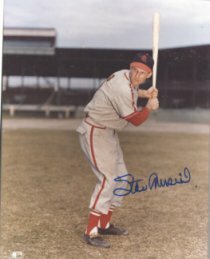 In his last at bat in the 8th inning of the 2nd game, Stan hit a home run that stood as the winning margin in a 3-2 Cards victory. Now on Sunday afternoon, the game started off pretty well for Hook as both Curt Flood and Julian Javier hit meek little comebackers to Jay. But then Bill White steps in and lines a homer over the wall in right. Then up come Stan batting cleanup, who promptly lines another home run over the right field wall. From my seat which was halfway up the upper deck behind home plate a little to the 1st base side, it was hard to see how both those homers could have missed hitting the overhanging upper deck. They both had the same arc shape as Bobby Thompson’s HR in 1951. So Stan has his 1st HR this game, but now 2 in consecutive at bats, going back to the game the night before. Things settled down until the top of the 3rd when Bob Gibson leads off. He launches one to left, following the Bobby Thompson arc and the ball disappear over the wall. It’s 3-0 on 3 homers and it was quite a sight to see Gibson lope around the bases because he actually had the aura of a power hitter about him. Stan came up later that inning and walked. In the 4th inning the Cards erupt for 5 runs. Gibson has an RBI single and Stan caps it off with his 2nd homer of the game --- this time lining it into the upper deck in right. The score is now 9-0. Mercifully, Willard Hunter replaces Jay Hook in the 5th and goose eggs for both teams the next 2 innings until Stan the Man steps in as leadoff batter in the 7th. There he is again: Mr. Corkscrew with the vertical bat. The old man of 42. This time the pitch comes in --- suddenly --- CRACK and I can still see the white of the ball as it rises high and deep, up, up and away and when it reaches its zenith it’s already straight above the overhang. As it floats down, it clears everything and disappears beyond the stadium roof. Home run number 3 for Stan in the game; his 4th home run in consecutive at bats. A moon shot. No, more like a comet rising and a meteor falling near the horizon. As he rounded the bases, everyone was cheering wildly and I realized that I was witnessing baseball history. The score got pushed up to 12-0 and that gave Stan a chance to come up again in the top of the 8th. People were cheering wildly again, now with every pitch. Would he hit #4 and 5th in a row? Gets to a full count, fouls 2 off but then Willard strikes him out. Mighty Stan has struck out. But wait, this is 1962 in the Polo Grounds. This is da Mets. Yes the 3rd strike was right in there, swung and missed at by Stan, yet somehow the ball gets by the intrepid catcher Chris Cannizzaro and rolls to the backstop, which is a lot farther back than today’s stadiums. Stan simply trots to first base and is safe without even a throw being made. So the streak is over. We are all disappointed. We exhale, and then manager Johnny Keane decides to take Stan out for a pinch runner, Bobby Gene Smith. And as Stan slowly trots off, I realized that I wasn’t just witnessing history, I was being history as a part of history, and all the fans knew it, and this roar goes up, as everyone stands up and claps and cheers and hollers as this Old Man River, Stan the Man who tips his cap and disappears into the Cardinal dugout. But the standing ovation continued. I never felt more connected to baseball and to America as I did at that moment as Stan Musial, whose rookie season was 1941, meaning he was playing before Pearl Harbor, was now being honored and appreciated by 10,000 fans in a dilapidated old ball park in upper Manhattan with the most ramshackle of teams ever assembled. But nothing else mattered at that moment except the incredible exhilaration of basking in the presence of sheer greatness. What a man, that Stan the Man, for over 20 seasons. Inevitably, the game went on, and in the top of the 9th, Bob Gibson comes to bat. Now what was he doing still pitching with a 12-0 lead? Maybe he just wanted to feast on that sumptuous Met pitching because he promptly lines his 3rd hit of the game, a single that drives in the 13th run. He then scores the 15th run on a single by Fred Whitfield, but enough batters have come up to bat around, so that Bobby Gene Smith comes to bat, in Stan’s cleanup position. Suddenly, it dawned on all of us that if Stan had not been taken out for a pinch runner, he would have got another chance to bat in the 9th. But then, there would not have been that magical moment of appreciation and adulation and downright patriotism that happened after he did leave the game. Bobby Gene then flied out to end the inning. So now Bob Gibson is still pitching, taking a 2-hit shutout into the 9th. He might as well finish now and put the fitting final nail into this coffin of game for the haplessly accommodating Mets of 1962. But what happens? Leadoff batter Felix Mantilla lines a screaming shot into left center, it skips by the left fielder, Stan’s replacement Bobby Gene Smith again, and Mantilla ends up on 3rd with a rousing triple. Up comes CF Joe Christopher, batting an inspiring .217. He grounds out to second, Felix runs home and Gibson loses his shutout. At that point, I heard three distinct sounds in the Polo Grounds: (1) genuine cheering that the Mets had finally scored; (2) mock cheering that the Mets had finally scored; (3) booing that the Mets had messed up a fine shutout bid by Gibson. Finally, Richie Ashburn hits a fly ball to Curt Flood in center and the game is over: Cards 15, Mets 1. As I streamed out with the crowd, walking toward the 155th St, IND stop, to wait for the old CC local to rumble over and down to 145th, I felt like going over to find Stan’s moon shot, but figured someone must have gotten to it by now. The last major league baseball game ever played at the Polo Grounds was September 18, 1963. But that’s because the Mets played their last 9 games on the road. 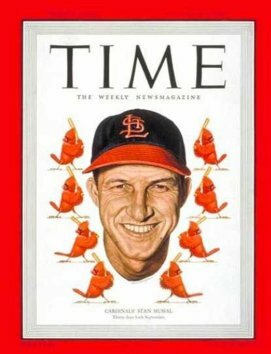 The last baseball game played by Stan Musial was at the end of the season on September 29, 1963. Less than 2 months after that, John F. Kennedy would be shot in Dallas, and somehow the magnificent sense of grateful history I felt at the Polo Grounds that summer day in 1962 was also shot with JFK. But no matter what, I still remember that coiled spring of a man with that flagpole of a bat who made me feel for one brief moment like I really belonged to the whole United States of America, not just Inwood, before it all got shot down in Dallas. But wait, it’s just a game, isn’t it? It’s just a baseball sailing out of a run down stadium, isn’t it? Well, OK, then, but maybe it’s also just a life. Isn’t it?